The "two sessions" was imbued with particular significance this year as it was the last session of the 12th National People's Congress (NPC) and the 12th National Committee of the Chinese People's Political Consultative Conference (CPPCC). For this reason, it provided a prime opportunity to analyze President Xi's first term in office. Numerous issues and bills were proposed and debated during the recent sessions, but I would like to highlight one in particular: This year the bill for the General Provisions of Civil Law has been approved. This is a significant step towards the promotion of the rule of law as a strategic vector in China's development. Discussing the rule of law is not a new topic in official CPC discourse. In 1997, the report of the 15th CPC National Congress stressed the importance of "governing the country according to law and making it a socialist country ruled by law." Then, in 1999, an amendment to the Constitution was made using those very words. However, it has only been during the presdiency of Xi Jinping that the question of the "rule of law" has acquired such strategic and comprehensive importance in the Chinese economy and society. This is a product of the huge changes that the country continues to undergo and the challenges arising from China being the world's second largest economy. In 2014, a year into Xi's presidency, it was established at the Fourth Plenary Session of the 18th CPC Central Committee that the general objective of the CPC was to build a country based on the socialist rule of law with Chinese characteristics. It was the first time in the Party's history that a plenary session had chosen the rule of law as its central theme. President Xi made the fight against corruption one of his top priorities. After all, a state where corruption reigns as a result of the leniency of the government should regard that government as its own worst enemy. Corruption is a virus that defiles justice and weakens the law for the benefit of the powerful. Mindful of this, during the Third Plenary Session of the 18th CPC Central Committee in 2013, President Xi announced that judicial reform would play a major part in China's overall reform. Recent redressings of wrongful judgements by Chinese courts have sent a clear message that the Chinese judicial system is not just concerned with respecting the due process of law, but also about making materially just decisions. The fight against corruption and the new judicial reforms show that the Chinese government is aware of the fact that good governance cannot be promoted without the rule of law. Having assumed this position, China's government is intent on proving that China's socialist democracy is fully compatible with the rule of law. Today, China has approximately 600 law courses and law departments in its universities. 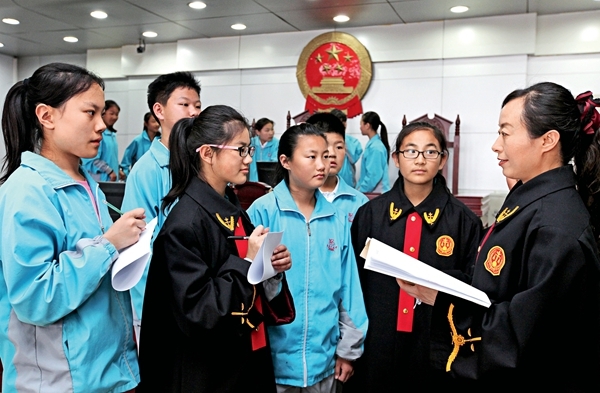 The teaching of law will contribute to the making of a better judicial system for the Chinese population. Legal education is, therefore, a key element for the development of a legal culture in line with the objectives of the nation. For a country with 1.3 billion people, disseminating a legal culture based on litigation would just increase the costs of maintaining an increasingly expensive and clunky judicial power. This would have negative repercussions on the national economy and political system. These are the problems that countless Western countries are facing and which are undermining the legitimacy of their democracy and governance models. The West is still little acquainted with the Chinese political and legal system and its model of socialism with Chinese characteristics. However, China is trying to show the world new possibilities for building a legal culture with a structure quite different from the models generally adopted by the West. The "two sessions" and the system of the people's congress are two of the best features of the Chinese model. Now, with the approval of the draft bill for the General Provisions of Civil Law, we can say that China has ushered in a new era: an era when law will play a fundamental role in the process of China's reform and opening up, and help the country to achieve its centennial goals of 2020 and 2050. Discussing the rule of law is not a new topic in official CPC discourse.